Pete Newlands and team from Cowes have won the Beneteau 40.7 national championship which was held this weekend in Christchurch Bay and hosted by the Royal Solent Yacht Club. Newlands sailing his four-year-old yachtAnticipationwon the closely-fought championship with 1,3,2,2 scoreline, beating Tim Spalding and team onAmey Loveshackby just three points. A total of 16 boats headed out to the startline early on Saturday morning but the ‘mill-pond’ conditions for the scheduled three races didn’t bode well for a particularly exciting day on the water. However, after a long postponement, well into the afternoon, a 6-8kt breeze filled in from the south-west, allowing the race officer to set a course. 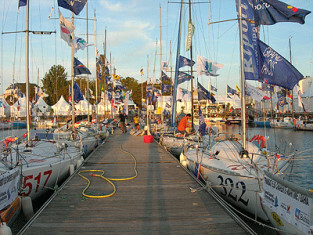 Proceedings were delayed further when the first race had to be abandoned after a sailing instruction discrepancy. Once finally underway the first race of the event over a short windward/leeward course, went to Stuart Hemmingway’sBeam, withEuphorixsecond and Newlands’Anticipationin third. The second race which didn’t start until 1600 was probably one of the shortest big boat races on record, lasting just 28 minutes – just one round of the windward/leeward course.Euphorixhad a good start once again in clear air crossed the finish line in first with Paul Jenkins and team onAddictionin second, andAnticipationa consistent third. An impressive, port-hand flyer at the start of the final race on Saturday (passage race back to Yarmouth) resulted in a good lead on the first leg out towards the Needles byBig Bamboo. However, by the long run back towards Lymington they’d been overhauled byActiv Addiction(Jenkins), who themselves were unable to hold off those who’d taken the mainland route which includedAnticipation(Newlands) who took first. In total contrast to the previous day when light winds played havoc with the race schedule, competitors were treated to a lively session on the Sunday for the final two races out in Christchurch Bay. The racing on short windward/leeward courses once again but this time in 20kt of breeze put a premium on slick crew work and it was here where teamLoveshack- overall winners of Class 4 IRC and Black Group at this year’s Skandia Cowes Week – really showed their true colours by winning both races. Spalding commenting on the final day’s racing said: “It was absolutelyLove Shackconditions out there today and the crew bucked their ideas up a bit from the previous day when we had two fifths and a fourth. The morale was also good exceptionally good out there today. Pete Newlands did very well. Newlands is a smart guy and he managed to put it all together. Although there was a relatively small fleet at this weekend’s event, the class has generally seen a big increase at some of the season’s other major events including a record fleet of 45 at this year’s Round the Island Race. There were also over 30 at this year’s Skandia Cowes Week with the top of the IRC Class 4 dominated by the Beneteau 40.7.